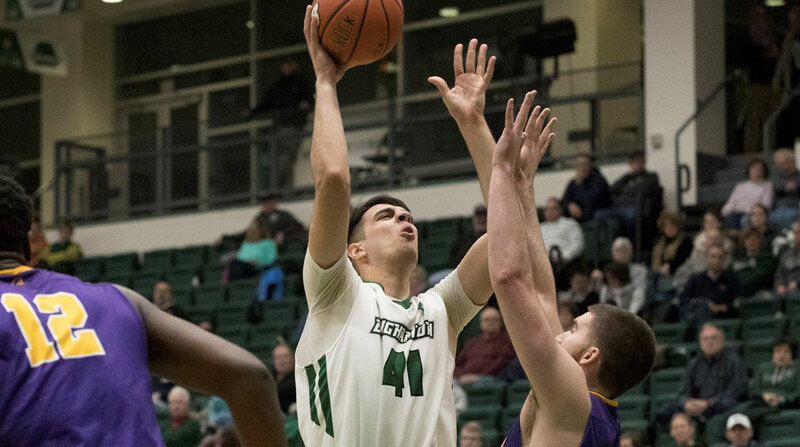 Provided by BU Athletics Junior center Dusan Perovic tallied 12 points in 13 minutes of action in the Bearcats’ loss to Stony Brook. Four weeks ago, the Binghamton men’s basketball team defeated Stony Brook for the first time in 14 tries. But a lethargic performance in their second matchup of the season against the Seawolves (17-10, 12-2 America East) sunk the Bearcats on Saturday night. Stony Brook handed BU its sixth straight loss, 76-55. BU behind early, and never caught up. The Seawolves took a 14-point lead into halftime before extending their lead by seven points in the second half. Senior guard Marlon Beck and junior center Dusan Perovic led BU with 20 points each. Freshman guard Akwasi Yeboah led Stony Brook with 19 points. He shot 7-for-11 from the field, including three from beyond the arc. He was followed by junior forward Tyrell Sturdivant, who knocked down 10 points. The Bearcats struggled from the field against the Seawolves. BU shot 33 percent clip while Stony Brook shot 47 percent from the field. BU is set to continue AE play against Hartford on Wednesday. Tipoff is scheduled 7 p.m. from Chase Family Arena at the Reich Family Pavilion in West Hartford, Connecticut.